Amit Singhai's practice is concentrated on patent counseling and litigation, focusing on patent matters arising under the Hatch-Waxman Act. Specifically, Dr. Singhai offers advice concerning validity, infringement and patentability issues in the areas of pharmaceutical sciences, biotechnology, and chemistry. He is also involved in conducting prior art searches, expert search, drafting opinions, and document review during patent litigation. In 2012, Dr. Singhai began working as a Scientific Advisor with the Intellectual Property Group, while the Group was affiliated with its prior law firm. 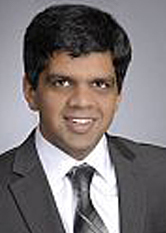 Dr. Singhai was previously a TPCB (Tri-Institutional Training Program in Chemical Biology) research fellow at Cornell University, Ithaca, NY, where he worked on utilizing advances in nanotechnology and protein chemistry to develop biophysical tools for studying receptor mediated signaling in cancer biology. He has also done research directed towards understanding the molecular mechanism of allergic reactions. He has extensive research experience in the area of cell biology, chemical biology, microscopy, and cell signal transduction. He is also well-versed with standard chemical methods such as FTIR, NMR, XRD, and chromatography. He has co-authored publications in peer reviewed scientific journals and has given invited talks in international scientific conferences and workshops.